Your time may come. Do not be too sad, Sam. 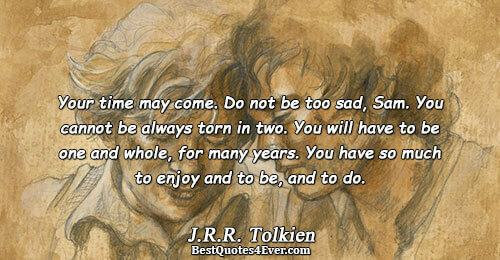 You cannot be always torn in two. You will have to be one and whole, for many years. You have so much to enjoy and to be, and to do. God created night and day without your help, enjoy His gift of rest tonight. Tomorrow will bring showers of blessings and joy! Good night, you are safe in His hands. Despite the fact that I have no regrets about how things turned out in my life, I still can't help wanting to understand my intense relationship with Leo, as well as that turbulent time between adolescence and adulthood when everything feels raw and invigorating and scary-and why those feelings are all coming back to me now. the sound of her eternal sigh. Only you, Will Traynor, could tell a woman how to wear a bloody dress. I suppose in the end the whole of life becomes an act of letting go. But what always hurts the most is not taking a moment to say goodbye. Goodbyes are on of the hardest things about life. One way or another people were always leaving... Always moving on. If we let them and we help them in return. And there it is: Even though we’re standing in the same patch of sun-drenched pavement, we might as well be a hundred thousand miles apart.